Background: Galactose oxidase (GOase) catalyses the highly selective oxidation of terminal galactosides on a wide range of natural glycoconjugates and has found wide applications in biotechnology – particularly in biocatalysis. GOase is copper dependent and uses oxygen to oxidise the C6-primary alcohol of galactose and produces hydrogen peroxide. The enzyme activity can be conveniently assessed by a colorimetric assay. Objectives: The objective of the present study was to develop an assay system, which is independent of the hydrogen peroxide formation to identify possible fluorinated GOase inhibitors. In case that the inhibitor bears a primary or secondary alcohol, it could also be oxidised by the enzyme. In such case, the colorimetric assay is not able to distinguish between substrate and inhibitor, since oxidation of both molecules would result in the formation of hydrogen peroxide. Methods: D-galactose (D-Gal) was immobilised onto a gold surface functionalised by selfassembled monolayers (SAMs,). A GOase solution was then added to the surface in a droplet for a certain period of time and thereafter washed away. 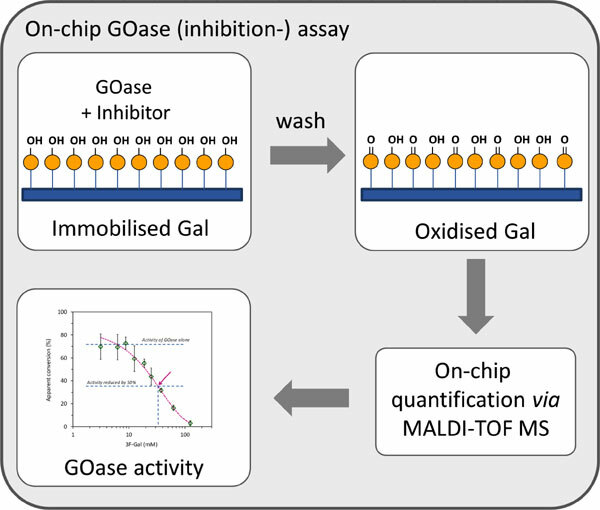 The activity of GOase on the immobilised D-Gal can then be quantified by MALDI-ToF MS. Results: For inhibition studies, GOase was incubated together with 62.5 mM of deoxy-fluorinated monosaccharides on the D-Gal displaying platform. Five deoxy-fluorinated D-Gal showed a >50% inhibition of its activity. The array system has been moreover utilised to determine the apparent IC50 value of 3-F-Gal 15 as a proof of principle. Conclusion: The developed array platform allows the fast identification of GOase substrates and inhibitors from a library of deoxy-fluorinated sugars using MALDI-ToF MS as a label–free readout method. In addition, the enzymatic reaction enables for the in situ activation of sugar-coated surfaces to bioorthogonal aldehydes, which can be utilised for subsequent chemical modifications. Keywords: Biooxidation, galactose oxidase, biocatalysis, glycan arrays, bioorthogonal chemistry, surface functionalisation, inhibitors, fluorinated sugars. Keywords:Biooxidation, galactose oxidase, biocatalysis, glycan arrays, bioorthogonal chemistry, surface functionalisation, inhibitors, fluorinated sugars. Abstract:Background: Galactose oxidase (GOase) catalyses the highly selective oxidation of terminal galactosides on a wide range of natural glycoconjugates and has found wide applications in biotechnology – particularly in biocatalysis. GOase is copper dependent and uses oxygen to oxidise the C6-primary alcohol of galactose and produces hydrogen peroxide. The enzyme activity can be conveniently assessed by a colorimetric assay.